Lee will probably kill me, but I couldn't resist getting out the camera yesterday. 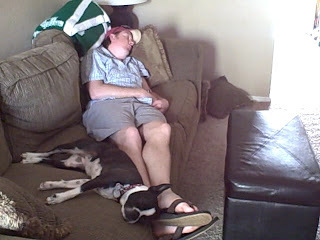 This is what was going on at our house....everyone napping but me! I did, however, enjoy the quiet time by myself. 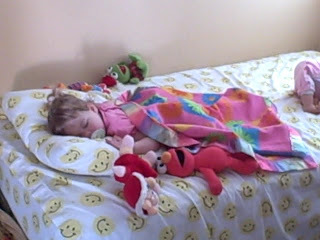 Baby is now sleeping and napping in her big girl bed!! Four nights in a row now. Yay Becca! That crib will be coming down in a few days. You will also notice it's now a party in the bed--Ernie, Elmo, Miss Piggy, Kermit and Sissy....glad there's lots of room for Becca! I blogged last week about how I am trying to raise $10,000 for the American Cancer Society, so I thought I would give you an update. After 10 full days, the cover kid contest has raised just at $3,000!!! YAY! We are well on the way to hitting that goal. They have until May 15 to raise the money for the contest. If you would like to help, you may know some of the kids in the contest that you can support. I know we have a lot of readers--some with Wynne connections, and some with work connections. I'll give you a couple of options. Murray (Crawford) Austin's twins, Andrea & Madeline are currently in 2nd place. You can vote/donate for them at http://main.acsevents.org/goto/andrea.madeline . If you have an ACS connection, you might know these two kiddos. Marty's grand-daughter, Ellie is here http://main.acsevents.org/goto/elleanna . Erin Freeze's daughter, Kinley, is also participating. Find her at http://main.acsevents.org/goto/kinley . If you feel compelled to help us out, that would be lovely and much appreciated. The American Cancer Society is doing great things for your community! My baby girl is 23 months old today. Yes, that's right....next month, she'll be TWO! How did this happen? Where did my baby go? I swear she is growing every night in her sleep. I used to rock her and hold her, but now I just get a hug and kiss before bed with a wave good-night. A couple of things I don't want to forget. The other day Becca got in my face and said "MEAN!" I think she was calling me mean?? Which should not surprise me, since she also told Lee that "I boss!" (referring to herself, of course). Oh dear. I'll have some pics from Tracy's visit up soon. Becca sure did enjoy Easter this year! We weren't sure if she would "get" the whole hunting egg thing, so we started practicing in the house a couple of days before Easter. Luckily, I only had a half dozen plastic eggs, but I think we hid them all over the house about 20 times! We took Becca to Gulley Park on Saturday for our annual church egg hunt. There were lots of kids and puppies, so she was thrilled! She was also happy about all the "aigs" and treats she found. We brought home 21 in her basket! Nanny and Grammy spent the weekend with us, and they were thoroughly entertained by the little ham. This is Saturday afternoon, after the official egg hunt. She didn't get enough the first time, so she put Nanny and Grammy to work in the yard. Boy, the Easter Grannnies (I mean, Bunny) sure spoiled Becca this year! Look how she racked up! Here we are at the park. We were so lucky that Becca's grandmas could come too! It was a little chilly outside, but we were thankful for the sunshine. As you can see, there wasn't much "hiding" really. Almost forgot to get out the bunny ears! Ok, so this blog is usually about Becca and what's going on at home. I don't talk much about myself or what I'm doing. But today I will make an exception to share something that I'm doing at work that (hopefully) will be HUGE! I am trying to raise $10,000 for the American Cancer Society. Yes, for real. Can you say job security?? How will I do that, you ask? I have gotten a local family magazine, Peekaboo, to help me out. We are doing a cover kid contest to benefit Relay For Life. It's so easy! Parents just send in a photo of their child and the $10 entry fee to participate. It's not a contest based on looks, it's based on philanthropy! The child that gets the most online "votes" (i.e. donations) will be on the July cover of the magazine. The rest of the top 10 fundraisers will have their pictures inside. I'm so excited about this! The deadline to enter is next Tuesday, April 7th. Right now, we have 17 kids signed up and I'm hoping to reach 20 by Tuesday. The catch is that the kids must live in the Northwest AR area. If you read this, and meet the criteria, I hope you'll consider getting involved. All the info can be found at http://main.acsevents.org/arcoverkid or www.peekaboonwa.com . If you cannot participate, or do not qualify, you can still help me out! Since I am not putting Becca in the contest for fear of being accused of not being fair, you can instead donate to my personal Relay For Life team at http://main.acsevents.org/goto/Rhonda.Bramell. I know we're all broke right now, but anything--even 5 bucks will help out. It's been a while since I did an update on what Becca likes and what crazy things Becca does. So, here goes. Becca really likes to "help" with chores around the house, especially unloading the dishwasher and dusting. Becca would play outside all day, every day if we let her. She is finally at the point of giving us hugs and kisses!! YAY!! In fact, our morning routine is to kiss/hug good-bye when we leave. If you kiss her when we're still in the kitchen, she will insist on another hug/kiss at the door just when you are finally walking out. It's so darn cute! I never thought she'd be such a lover. Of course, she still loves the Muppets and Ernie. In the past couple of weeks we've watched both Madagascar movies. Lately, she has been walking around the house saying, "moo it, moo it!" So cute. Becca is starting to talk in sentences a little bit. She has mostly said, "I got it!" and "I did it!" She really, really likes going to MMO twice a week. We can tell because she talks about school all the time, and her teachers Anna and Beth. Another way I know that she likes school is because the other day I asked her "What's your name?" and she answered, "ANNA!" very excitedly...haha. And probably the funniest thing of all is that she sometimes calls us by our first names. She knows her daddy is Lee and her mommy is "Ronna." Here's a little video of the kids I took last night. Becca now regularly looks for ways to aggravate poor Fergie. This is one of the games they play--the ball is stuck in the door of the toy fridge and Fergie can't get it out.